England’s Jurassic Coast, stretching from East Devon to Dorset on the mainland’s south coast, is famous for it’s dinosaur fossils, staggering scenery, and celebrity endorsed fresh fish restaurants. The World Heritage Site is a popular spot for the more refined holidaymakers as a result and a far cry from the stereotypical images you no doubt associate with English seaside towns. It seemed fitting therefore that we feature a far more wholesome meal than our average, calorie busting, posts. 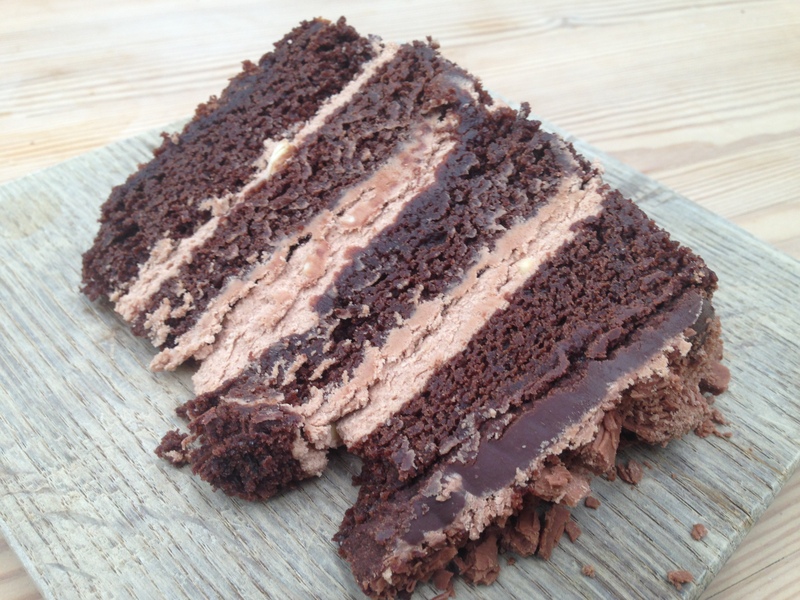 Allow us to introduce you to The Bakery in Lyme Regis. The Joint: The Bakery, 2 Coombe Street, Lyme Regis, Dorset, England, DT7 3PY. Unfortunately they don’t have an official website but you can find their TripAdvisor page here. 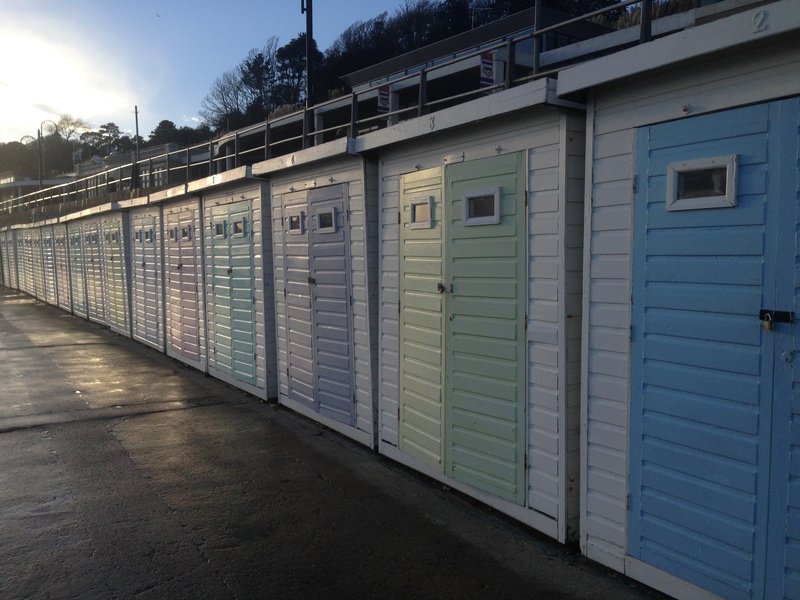 The Vibe: Lyme Regis, with it’s steep roads and numerous gift shops, is a quaint seaside village and home to just over 3,000 year round residents. Like most coastal locations they host huge numbers of visitors the minute the sun pops out and the temperatures dip over 20 degrees. Cars pack the limited parking and the huts on the beach do a roaring trade in crab sandwiches and fresh ice cream. It can get busy but it’s always a nice break from commuting into London each day. The weather isn’t in our favour today though – the sky has blackened overhead and the wind is whipping across Lyme’s famous Cobb (the town’s harbor wall). We spend a few moments shuffling pennies into the dated arcade and then beat a hasty retreat across the main road and down the narrow Coombe Street. The Bakery is, rather unsurprisingly, a working bakery and one that serves a limited selection of freshly baked good each day. It’s a rustic and ‘as you see it’ joint too. The staff prepare the food just yards from your communal bench, it’s ready when it’s ready and not a minute before, and the lunch options change on a daily basis. 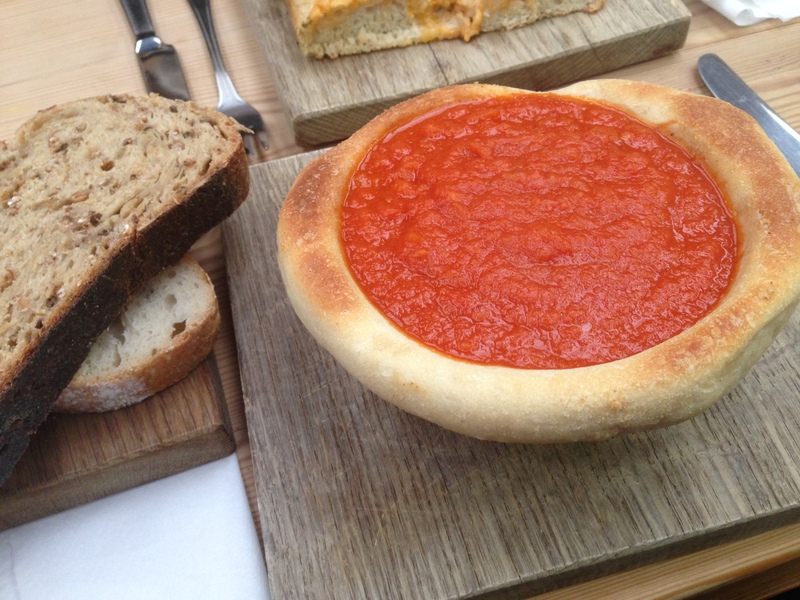 During this lunch sitting we have the choice of tomato soup, vegetable curry, and focaccia pizza. We plump for the soup and the pizza, serving ourselves from the worktop. 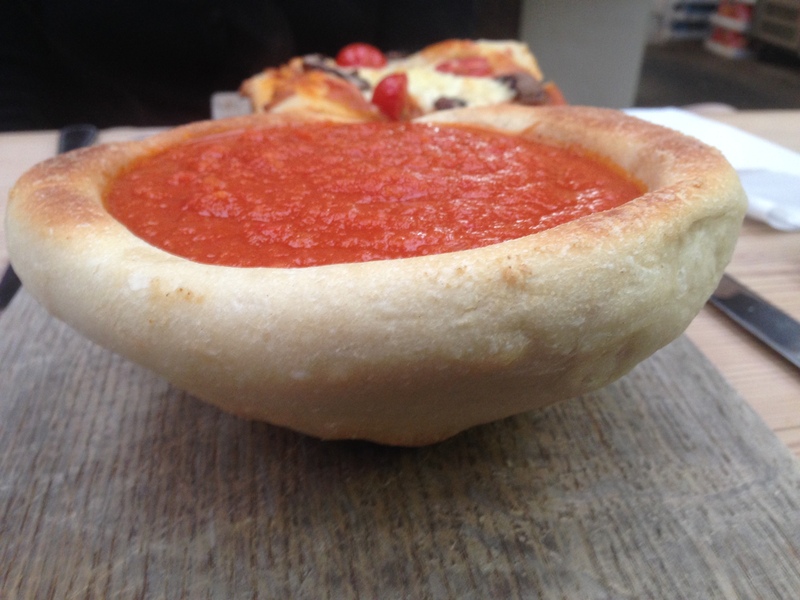 Whilst the pizza was pretty decent, it’s the tomato soup served in an edible bowl that really catches our eye. It’s nourishing, full of flavour, and actually manages to turn soup into an exciting dish. We’ve wanted to cover soup for some time however, taste aside, nothing has looked as appealing as this bowl before. We help ourselves to some extra sourdough bread from the counter to help us through the stock, spreading some of the huge mound of communal butter on for added taste. The beauty is really in seeing the empty bowl and knowing that you’re only halfway through lunch still. 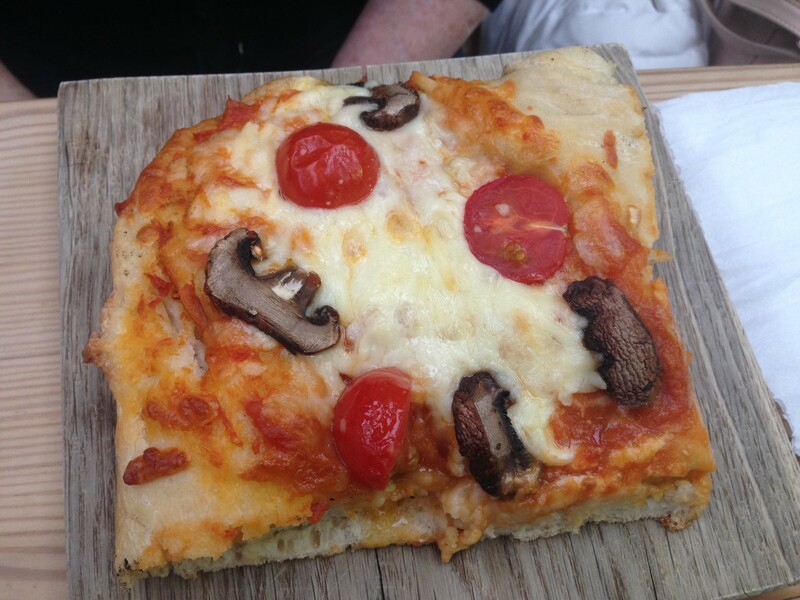 If anything the light covering of tomato made the left over bread feel like a bonus pizza…read that again…BONUS…PIZZA. The fun doesn’t stop there though – when lunch ends The Bakery roll out an impressive selection of cakes. They’re ridiculously huge in stature, crammed full of sweetness, and are some of the most indulgent items we’ve covered to date. We treated ourselves to slices of chocolate fudge cake topped with Cadbury’s Flakes and Coffee topped with walnuts. We’ll let the photos tell the rest of the story here…. 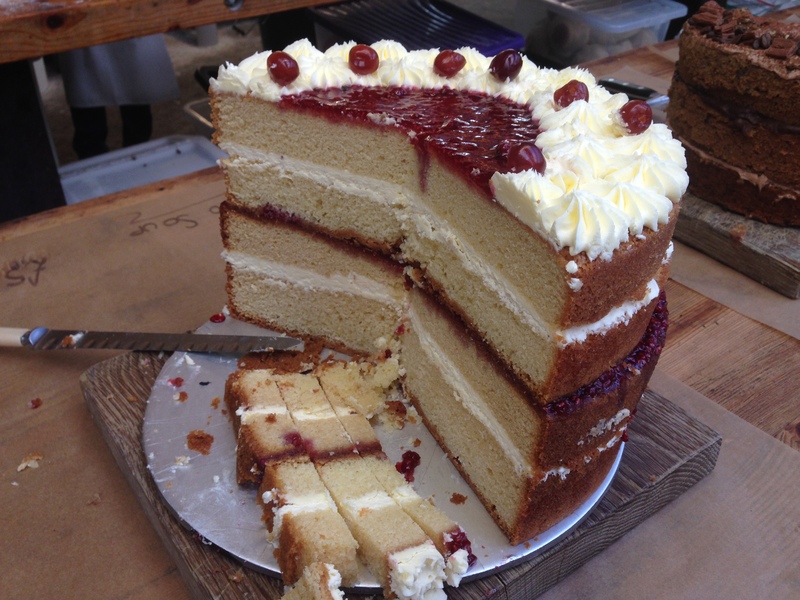 We also took a few photos of their victoria sandwich too (made with roughly 20 eggs according to the baker himself). Hot damn. Whilst a trip to Lyme Regis is rewarding in itself – step away from the beach and treat yourself to an experience at The Bakery. 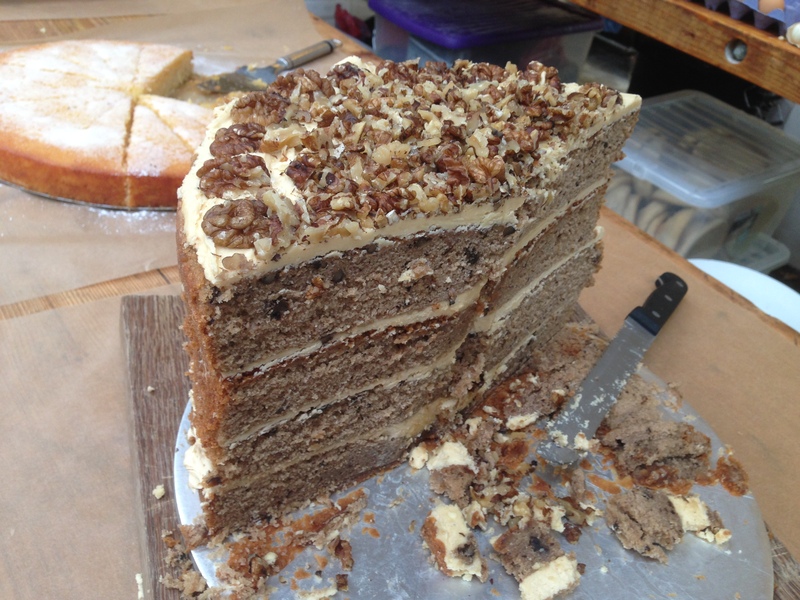 They serve good quality, heart warming rural food and follow it up with some seriously impressive cakes. The Price: £5 for each lunch item and £3 for a slice of cake. 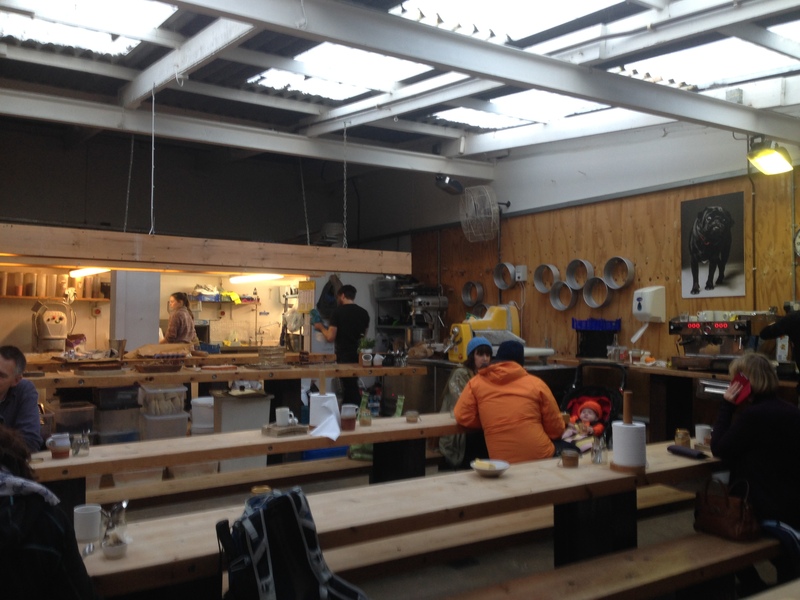 The Bakery was visited by Tom in November 2014. Posted in DorsetTagged bakery, cake, chocolate, coombe street, dorset, flake, focaccia, homemade, lunch, lyme regis, lyme regis cobb, pizza, rustic, seaside, soup, The Bakery, the cobb, tomato, tomato soup, victoria sandwich, walnutBookmark the permalink.